Alexander Davis (‘19) works on a computer during a CSS meeting. Computer science students participated in a “hackathon” event on Nov. 4. Three different teams, two groups of three and one individual, worked on independent coding projects in Olin for twelve hours — with a few breaks! — and then were judged on how usable their final product was. The hackathon was organized by the Computer Science Society (CSS) which is a new student organization this year. Each team came in with an idea about what they might want to accomplish, though for the most part they started from scratch. The project that was deemed the closest to being ready for use was a new website for Luther’s Caf menu. Hackathon was CSS’s first event this year. 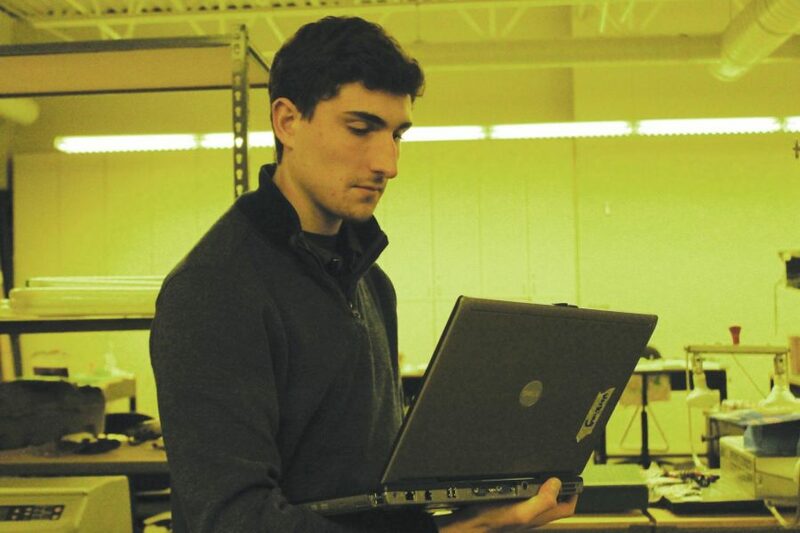 Vice President of CSS Alexander Davis (‘19) said that he hopes to have another hackathon in the spring because it is a way to set aside time for students to work on their own projects. Davis’s three person team worked on an app for the laundry machines in the residence halls. The app would ideally keep track of which machines were in use for the benefit of the students, as well as tracking sustainability in the residence halls. The other two members of his team were first-years who had not had much previous experience in this type of work. Assistant Professor of Computer Science Roman Yasinovskyy was one of the two judges at hackathon. He said that the biggest factor he kept in mind while judging the projects was how close they were to being usable. He hopes that the students will keep working on the projects they started during hackathon. 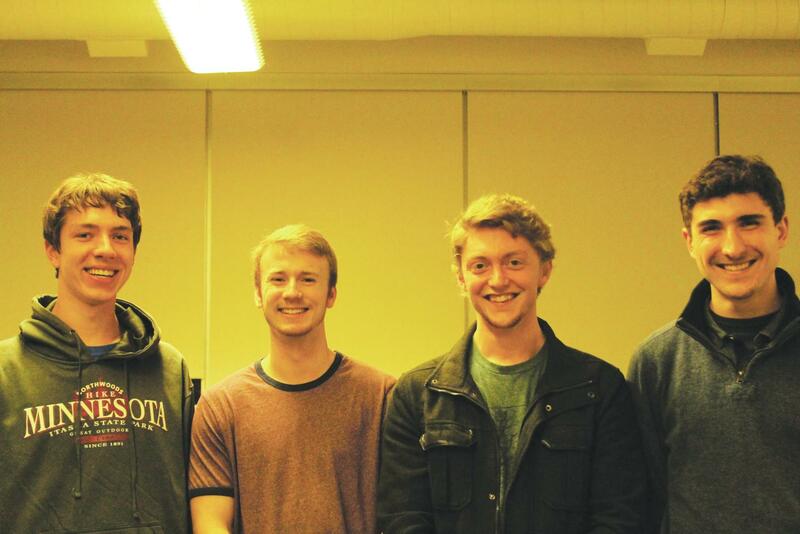 Computer Science Society members Bradley Kovacovich (‘19), Aaron Zerfas (‘19), James Miller (‘19), and Alexander Davis (‘19). Yasinovskyy said that hackathon is beneficial to students because it is not a class assignment and it gives them a chance to learn from each other. He encouraged first-year and sophomore advisees to go and work with junior and senior computer science students. President of CSS Aaron Herman (‘18) came up with the idea for the new Caf menu and led a team of three students who had never done web programming before in developing the idea. “It would be nice for the website to know the day and the time automatically and tell you what is being served when you open the page,” Herman said. Herman is meeting with Dining Services about the project and says that it will soon be available for Luther students to use. He said that CSS was formed because of a need for mentorship among computer science students. At weekly CSS meetings, they have some workshops on subjects that may not be taught in lower-level computer science classes. “Some of the stuff we talk about is taught in the Luther computer science program, but first-years don’t get to take a lot of the fun stuff until later on,” Herman said. The hackathon was another way for CSS to make sure students at every level can get involved in the “fun parts” of computer science outside of class. The participants received prizes after the event, including water bottles and T-shirts from a few local companies. “Not to be that person, but I think the real prize is that completed project,” Davis said.